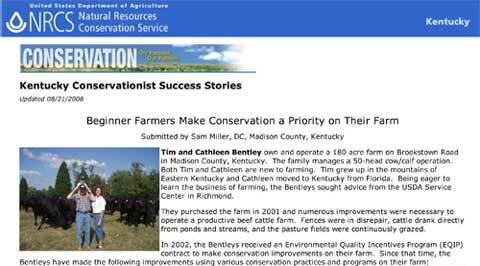 Bentley Farms, founded in 2001, is a family owned business committed to managing our farm for efficient production of excellent quality of forage and livestock. We strive to become excellent managers of our farm to benefit our family, community, and our country. We challenge ourselves to improve our cow/ calf herd and land by continually increasing our knowledge and experience. Diligent research of our genetic influence in our livestock increases our herd performance. Financial success of Bentley Farms is ultimately achieved through marketing and a dedicated work ethic. Our rural farm environment provides a beautiful atmosphere and time for farming, recreational activities, and personal growth for each of us. Our values are to conduct our business with integrity, pride, and Christian faith and to take care of the land, environment, and animals in which God has blessed us. Thank you for visiting our farm! Have a wonderful day! We have made the NEWS! Click below to see the full Article! Copyright © 2019 Bentley Farms. All rights reserved.